Date 08.12.2015 The Down Under Centre is conveniently located adjacent to Ealing Broadway station, occupying the first floor of the original Ealing Station which was built in 1838. 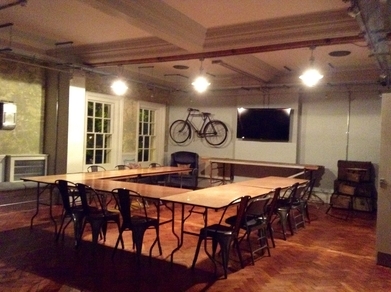 Surround yourself with an Australian atmosphere and hire out our newly renovated room, perfect for your training programmes, seminars, conferences and business meetings. Our venue is unique, full of character, with natural lighting and a warm welcome. The venue has been booked out for a number of successful and memorable events. We currently hold Electrical Practical Assessments and the IELTS exam to support the Down Under Centre’s core business of providing skills assessments for people in the UK and Ireland who wish to migrate to Australia and New Zealand. We have tables, exam desks and chairs available for a variety of room settings, plus whiteboard, flipchart, WiFi, and large screen TV to which you can connect your laptop for your business presentations or classes etc. An onsite kitchen is available for your use.